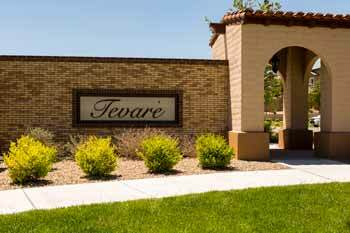 Tevare is one of Summerlin's newest gated communities inside of The Paseos. This lovely neighborhood features 5 stunning floorplans, all of which can be customized your personal tastes and preference. Call today to find out how you can become the next home owner inside this exclusive community. Given the close proximity to Red Rock National Conservation area it's no wonder that people are strongly attracted to living here. It's common to find groups of cyclists leaving in the morning for a quick loop around the "ring." KB Homes is doing an incredible job with the features and design options, expect nine foot ceilings, gorgeous kitchens with light and bright windows, lofts, and balconies. When we recently visited we fell in love with the master bedrooms, if you don't like stairs be sure to ask us which floor plans work best. Contact us today for any questions or to simply schedule a showing! See past sales, market activity and more with our instant market reports! Create one today and get access to information and insights not found on national sites. © All Rights Reserved Each Office is Independently Owned and Operated. RE/MAX, LLC is an Equal Opportunity Employer and Supports the Fair Housing Act. Any unauthorized use of trademarks or content from this website is strictly prohibited.